Dovetail saddle manufactured by ADM Accessories mounted near the centre of mass of the large optical tube. 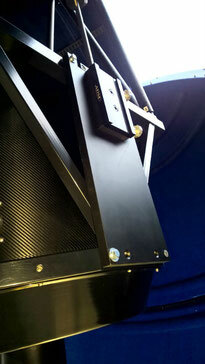 A standard D series saddle from ADM Accessories enables mounting auxiliary telescopes piggyback on the 62 cm telescope. In order to fasten the ADM saddle to the ASA truss tube, my neighbour, a professional machinist, cut a 510 mm long, 20 mm thick aluminium plate to fit the M6 threaded mounting holes on the mirror cage of the ASA truss tube. The ADM saddle is fastened to the aluminium plate near the centre of mass of the optical tube assembly, just above the middle of the image. Thirty-four kilograms of additional counterweights on the declination axis balance the mass of the saddle assembly, 120 mm refractor (not shown) for wide-field imaging, filter wheel and camera.